The Small Reactor provides power to the entire grid it is placed in by consuming Uranium Ingots. It is capable of providing a respectable amount of output at the cost of resources, but it is far less space-efficient compared to a Large Reactor. (Electrical efficiency is the same.) For more information on reactors in general as well as the mechanics, see Electricity#Reactors. In order to use the reactor, the player must first acquire the needed fuel. First Uranium Ore must be mined and then processed with the Refinery into Uranium Ingots. These ingots is what powers both the small and large reactors. Power consumption is based on the amount of output the reactor is generating. The higher the output, the more uranium is used. It is far more economical to build one large reactor in resources involved to construct and total mass, than building several smaller ones. Reactors will draw in their own fuel as needed from the conveyor system. If you wish to stop this, turn off "use conveyor system" in the reactor's control panel. On ships, conveyors require electricity to transfer items. 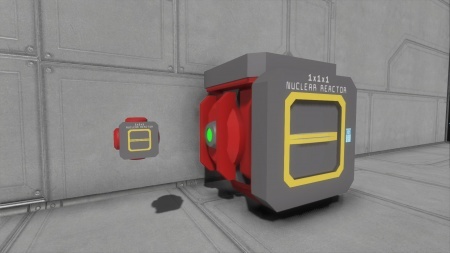 If you have internal reactors that cannot be accessed directly, you will need to power the ship temporarily through some other means, such as adding a small reactor to the exterior while you add fuel to the ship's conveyor system. This page was last modified on 18 January 2018, at 14:38.